Designing a Leisure & Lifestyle Program requires creative thinking and enthusiasm. Your main point of reference will be the assessment of your clients. These days, the level of client functioning is so varied in most assisted living facilities that despite all that is said about ‘Person-centered care’ and ‘Holistic care’ it is almost impossible to cater for each and every specific need. Most people living with dementia would benefit enormously from having one-on-one attention from staff on a regular basis. However that is not always possible due to work related constrains. Still, you should always strive to provide the very best leisure and lifestyle program that you are able to. What makes a good Leisure & Lifestyle Program? The key to planning effective activities is to remember that every activity you do has the potential to be meaningful. Your attitude and engagement with the client in a caring and considerate manner can make it so. As a starting point, there are a range of activities which have been tried and tested time and time again by other Recreation Therapists and Leisure Coordinators with very successful outcomes. 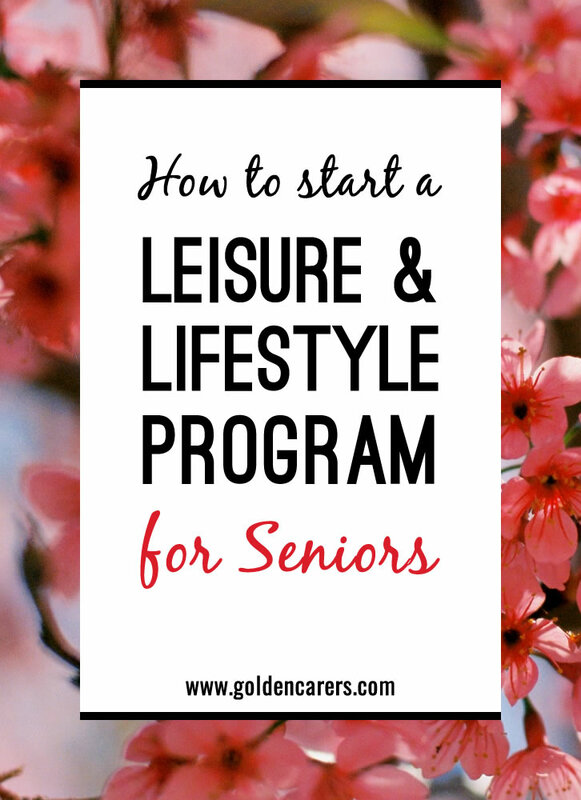 Start with a preliminary program for group leisure therapy and then incorporate personalized activities to meet the needs of individuals. For ideas and inspiration check regularly on Golden carers for video demonstrations, art projects, quizzes, jokes, table and floor games, craft and especially calendar events and celebrations. You may also check with your own colleagues. Drop in at another facility and ask to speak with the Recreation Therapist. Ask him/her what activities work best and then try them yourself. Remember that only you, through trial and error, can find appropriate activities for your clients and determine realistic expectations for these activities. Use the weekly or monthly program templates available on our website and make sure to request a monthly budget from management for you to purchase the necessary materials on an ongoing basis. I wonder where I can get face to face training for my Leisure and lifestyle staff and recreation activity officers please. Thanks so much for your feedback Terri! I made up a bingo that goes up to the number 40. I printed A5 size bingo cards and laminated them so clients can mark them with markers and they are easily wiped clean. the bingo balls are from a children's plastic ball pool large and colourful. I wrote the number on each ball with permanent marker. some times each client picks out a ball and sometimes if we have a client who can't play the bingo they will pick out the balls. we say rhymes/ songs associated with each number, ie 3 three blind mice....., 16 one client sings "sweet sixteen and never been kissed" and so on. everyone helps wipe the cards afterwards. The game is short and the clients don't lose interest so we often play two or three games. Love your DIY bingo game Anne, thanks for sharing. This sounds wonderful! We have a male resident who was a very keen gardener, so we have planted tomatoes, and he has taken over collecting them every day, plus watering them. he and another resident, were given the task of potting up the tomato plants for our market day, and working on the stall selling them! was a real win win!! I'm so glad I found this site! It's great to be able to share all our ideas around with others that work in the same industry and how wonderful, that our clients benefit from it! Hi Norene, one good card game is the 'Memory Game". Start with only two suits, say Hearts and Spades. Choose 40 cards; 20 of each suit, give to one participant to shuffle and then to another to cut. Give the cut parts to two participants to place on the table upside down. Each participant has a go at turning 2 cards up; if they match he keeps them; if not cards are returned to upside down place. The next player does the same and tries to remember where the previous cards were. Play until all cards are gone. The winner is the player with the most cards. I hope your clients like this. It is a very popular game. Good luck! Card bingo......have 2 packs, one (large size to enhance positive outcomes) for caller and the second pack divided between players. Modify depending on level of cognition/dementia but even those quite impaired can manage 8-10. Caller starts with cards face down and calls what it is...eight of hearts whilst allowing residents to see the card and compare/pick out their card. All cards turned over (face down or put aside) is the winner; however to promote success call out until last card is turned over. Hi everyone you all have great ideas. Anyone got any new simple card games for low care residents. thank you for this informative information, I am a trained art therapist working within aged care. My vision is to bring sensory programs and well-being prohrams, to people living with dimentia and pyscical disabilities using 'person centred approach'.